This is just a sample itinerary for a day tour without staying, tour 2 days 1 night and 3 days 2 nights tour. Each ship has a different itinerary. Visited attractions are also different. Activities are also not the same. Type of cuisine served and the manner of presentation is also dependent on the carrier ship. Especially for 3 days 2 nights tour, there is a tour that gives participants the opportunity to sleep in a ship’s cabin 2 nights, but there is also a 1 night on board, and one night at the hotel. You will be picked up at each hotel between 07.30 until 08:30. Furthermore, bus or minibus will take you towards the east towards Halong Bay. The trip from Hanoi to Halong City, approximately 3 hours taken. You will arrive at Halong City at around 12:00. travelers and other tour participants have about 5 hours to explore Halong Bay in the ship. Usually the first stop is Dong Thien Cung, a cave located in the remote little island. The cave is filled with stalagmite and stalactites. Selanjuntya you will be invited to visit Surprise Cave. Travel by boat continues to the south side of the bay to get to the Ti Top Island. Tour participants are given the opportunity to swim, play on the beach of fine sand, or climb the hill where you will be able to enjoy the view of Halong Bay from the heights. Travelers will then be brought back to Halong City, and then back to Hanoi by bus at 17.00. on the way home you will be invited to stop by the location of the manufacture of ceramics, where you can buy souvenirs. Around 20:00 you will arrive in Hanoi. 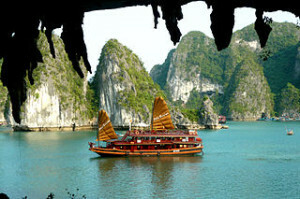 The cost of this tour usually includes taxes and service charges, roundtrip transportation between Hanoi – Halong City – Hanoi by bus or minibus, attraction admission, welcome drink, lunch on board in the form of Vietnamese cuisine with seafood, 5 hour tour of the timber ships, and tour guides speak English. Travelers will depart from Hanoi to Halong Bay to the use of a minivan or bus then arrive in Tuan Chau Island. Transfer boat and enjoy a welcome drink, briefing the safety instructions, check-in at each cabin. At 12:15 the ship began to sail towards Halong Bay while enjoying a buffet lunch Vietnamese and Asian cuisine. Arrive at Surprise Cave Hang Sung Sot or to explore the most famous cave in Halong Bay. At 16/00 start the transfer to the ship to get to Cua Van Floating Village and meet with local villagers. 17.15 continues the exploration of Halong Bay to get to Dong Tien, or Fairy Cave. Here you can swim or kayak. The ship will anchor here to spend the night. 19:00 tourists can enjoy the buffet dinner followed by evening entertainment activities such as music, film screenings, spa, perform a variety of games, and other activities as desired. The next day, at 06.00 Tai Chi session start on the deck followed by a morning activities such as kayaking, swimming, and so on. After that, the ship sailed to Halong City travelers while enjoying an international buffet breakfast menu. Travelers will arrive at Tuan Chau Island to later transfer of the ship to then leave for Hanoi. The cost of the tour is usually included insurance taxes and service fees, round-trip transportation between Hanoi – Halong City – Hanoi by bus or minibus, Tai Chi Session, welcome drink, 1 times lunch, 1 time breakfast, 1 dinner, speaking tour guide English, attraction admission, and lunch on board. Cost does not include tip, the cost of kayaks, drinks, spa, massage, and snorkeling equipment rental. Travelers will depart from Hanoi towards Halong Bay by bus or minivan. Upon arriving at Tuan Chau Island, Travelers will transfer to the ship and then follow the instructions safety briefing, check-in at the cabin while enjoying a welcome drink. Starting ships sailing to Halong Bay at 12 and tourists will enjoy a buffet lunch. Once it arrives at the Surprise Cave Hang Sung Sot or exploring caves and the most famous Halong Bay. After that further explore Halong Bay and meet with local villagers in Cua Van Floating Village. Arrive at Dong Tien, or Fairy Cave, tourists can swim or kayak. The ship will also be dropped anchor here or overnight. At 19.00 hours, travelers will enjoy a buffet dinner while accompanied by musical entertainment. After that, tourists are free to do evening activities such as spa, play a game, or watching a movie. The second day started in Tai Chi session on the deck in the morning. Travelers also can perform activities such as morning kayaking, swimming, and so on. International buffet breakfast menu will be served at 07.00. then transfer to a small boat to go to Cat Ba National Park. When it has arrived in Viet Hai pier, visitors can bike around the forest. Vietnamese lunch at a local restaurant menus can be enjoyed at 12.00. followed by a tour of the village enjoying the scenery or take a hike to the summit of Dao Hai Quan. At 15:45 tourists will depart from Viet Hai Jetty back along Halong Bay. Ba Trai Dao arrived at or Three Peach and Dong Tien, or Fairy Cave tourists can do snorkeling, swimming, kayaking, and other relax. ship will dock in this area for an overnight. The third day will begin with the same activity on the second day but only a few hours, after which the tourists will return to Hanoi. Travelers should bring a bathing suit if you want to swim or snorkel. Use sunglasses to sunbathe on the deck. Apply sunscreen to protect your skin from sunburn. Always carry the drug, although the vessel providing health box, it helps if you carry personalized medicine, according to the conditions of health. Bring private drinking water from the mainland. Mineral water is not included in the facilities provided by the vessel operator. From here they also benefit because the price of mineral water on board is very expensive. It’s good to bring a few bottles of great travelers for supplies. When you run out, you better buy at the kiosk located in attractions such as Ti Top or Cat Ba. Because the prices are generally cheaper than mineral water on board. You can also buy from the merchant ship approaching the wooden boat. Do not forget to bring a snack as your traveling companion.